A long day. I flew all night, arriving at 10am UK time in London, which was 3am Denver time. I had two easy flights, both times a full row of three seats to myself, which allowed me to lay down and sleep for a few hours flying over the Atlantic. Not great sleep, and I certainly feel my age as knees and back were stiff and sore when I got up. It was an easy ride up to Cambridge, though a bit of a surprise with snow on the ground in places. It's cold here, colder than CO. 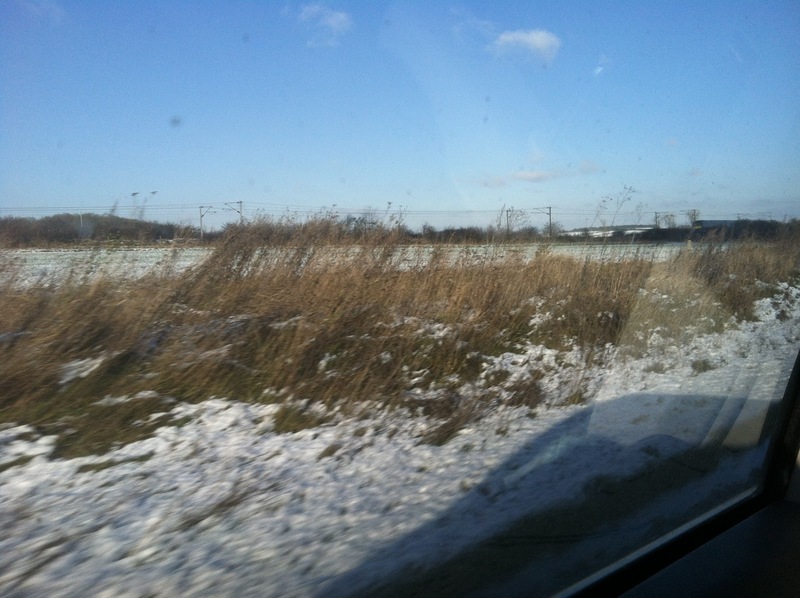 Here's a shot out of the car of the countryside between London and Cambridge. All afternoon were meetings. I had a quick pub lunch with my longtime Publishing associates, and then it was back to the office for essentially 3.5 hours of meetings with different groups, including a 1:1 with my boss. Good meetings, all of them taking opinions on what I think we should do, and presenting some plans that were somewhat "wet paint". Not sure if my opinion will influence of change, but it was heard. All in all a good, but long day. I managed to get in a nice lifting/running workout tonight, then go to the pizza place just down the road from me for a carafe of pinot grigio, a caprese salad, and a pizza.